It was a busy time leading up to the World of Coffee in Amsterdam. The team were working long hours, roasting crazy quantities of samples, packing equipment, finalising schedules, checking checklists. Then the Brazilians arrived. Everyone dropped what they were doing to meet Luiz Paulo Pereira and Hugo Silva from Carmo Coffees at the cupping table. What we tasted was like nothing we have come to expect from Brazil. Alongside the great washed and natural coffees we know and love from Carmo Coffees were these SL28 and Rume Sudan anaerobic newcomers: clean, bright with candy-intense fruitiness. Exotic varieties? New processing methods? Is this really Brazil? This is exactly the response Luiz Paulo Pereira was hoping for. This has been his mission since he started Carmo Coffees with his cousin Jacques Caneiro in 2007. The beginnings were not glamorous. The cousins, from a family of coffee producers, opened an export office in the small town of Carmo de Minas. It was important to look professional, so they hired Rose to work as a secretary and put a big white box of a computer on her desk. The machine didn’t work, but it showed they were a serious business; they had a secretary and a computer. They exported their first coffees in 2007, the same time CCS founder, Robert Thoresen, was in Brazil, sourcing for our sister roasting company, Kaffa Oslo. The three discovered a shared mission to showcase Brazil’s potential for specialty coffee, and began one of CCS’ longest running relationships. Twelve years later, Rose works in the QC department, Carmo Coffees employs 62 people, and all of their computers work. Carmo Coffees work differently to other coffee companies in Brazil. Firstly, they believe good coffee is born of relationships. Their sales force are called “Coffee Chefs.” Like a fine dining chef who sources the best ingredients and transforms them with passion and creativity into a delicious dish, the sales team must follow the coffee from the day it is planted until it is harvested, processed and delivered. Luiz Paulo beside an African drying bed used for micro-lot washed coffees. While Carmo Coffees have impressed us year after year for their consistent clean and fruity profiles, it was the coffees from Luiz Paulo’s new project, Santuario Sul, that had us all mesmerized in June. The project, which began almost five years ago, is a collaboration with Camilo Merizalde, the pioneering Colombian behind the Santuario project, plus the Santuario fermentation expert, Ivan Solis, from Costa Rica. The farm currently has 30 hectares of land in coffee production, and they aim to expand to 70 hectares very soon. They began by planting different varietals, 25 in total, making it the biggest coffee garden in Brazil. Last year they harvested a their first crop of Sudan Rume. This year saw the first harvest of SL28. The next step was to experiment with processing, specifically anaerobic fermentation. Rather than import expensive equipment from overseas, the team looked in their own backyard. Carmo de Minas is dairy country — Luiz Paulo's grandmother is as famous for her cows as she is for coffee — so they bought a fermentation tank used for cheese making. The closed steel tanks are easy to clean and feature double walls and temperature controls, which Ivan Solís adapted to the exact temperature range required for coffee processing. The tank used on Santuario Sul can process 2000 liters of cherries - around ten bags of green coffee. The cherries are hand-picked to ensure perfect maturity, then washed to remove any juice excreted during the picking process which can significantly reduce the clarity in the cup. The team then measure the Brix levels of the cherries. If they are higher than 23, the cherries are used for anaerobic fermentation. If the Brix levels are lower than 23, they are destined to become naturals. The selected cherries are placed in the adapted dairy tank for 60 hours without any movement, then the tank is opened to check the PH level. When the PH of the mucilage inside the fermenting cherries reaches 4.5, it is time to take them out. After fermentation the cherries are removed and left to dry with the cascara still intact. Drying takes between 18 to 21 days, depending on the weather. The resulting cup is the perfect combination of washed and natural: clean, bright, full of fruit and sweetness. Ivan Solis, fermentation and processing expert from Costa Rica, and Alessandro "Viola", processing manager at Irmas Pereira with the adapted cheese making fermentation tank used for anaerobic processing on several Carmo Coffees farms. 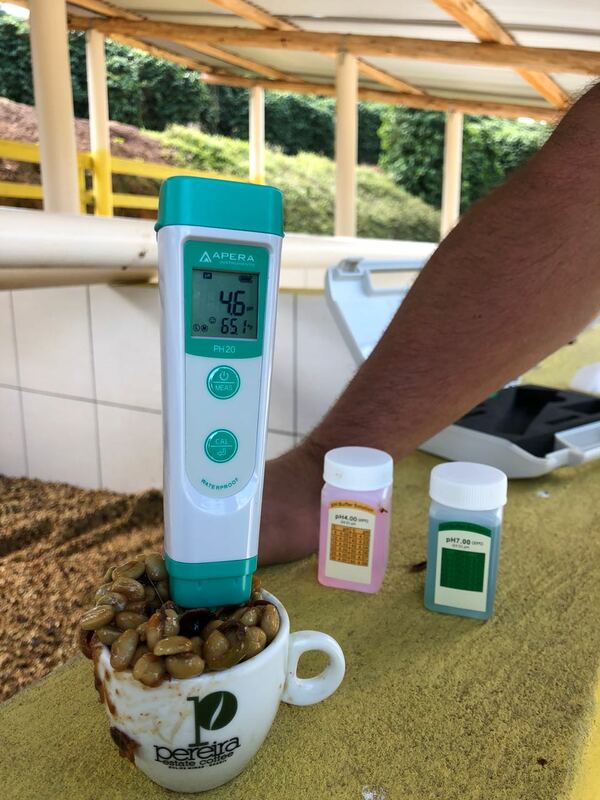 While Luiz Paulo notes that they are still learning, the initial experiments were so successful that they have installed tanks of three other sites: Fazenda Irmas Pereira (2000 liters), Alta Vista (2000 liters) and Pedralva (5000 liters). This is part of the Carmo Coffees approach. They are not interested in trends, or glamour, instead they aim to produce unique and delicious coffees year after year, which means everything must be repeatable. The natural processing on Santuario Sul differs from other naturals from Brazil primarily in the picking, which is done manually. Maturing is a particularly long process in this part of Brazil, and trees frequently have both flowers and ripe cherries at the same time, making hand-picking only mature cherries essential. After picking, the cherries are laid to dry on average for 23 days. In both styles of processing the cherries are hand sorted as they dry on the beds. Carmo Coffees recently ran a competition, men vs women, to see who could select the largest number of imperfect cherries in the shortest amount of time. The women won by a large margin. On the left, natural coffees on the drying bed. On the right, anaerobic. Look at the difference in color! The cherries are hand-picked for perfect ripeness. They are de-pulped with some mucilage left intact. The coffee is left to ferment for an average of 24 hours, or until the PH level reaches 4.5. It is washed to remove any remaining mucilage and dried. Micro-lots are dried on African beds. The initial layer of coffee on the beds is very thin and as the coffee dries, they increase height of the layers. Want to get your hands on some samples? Carmo Coffees will be special guests in Oslo at our Summer’s End Celebration in September, presenting more of these stereotype-busting coffees. Email bjornar@collaborativecoffeesource.com if you would like to join us. If you can’t make it to Oslo, add your details to the form below and we will contact you as soon as pre-shipment samples arrive. Thank you! We’ll let you know as soon as those samples are on their way.